Both Lazio and Cagliari are desperate to end their lengthy winless streaks, but the pressure is building on Simone Inzaghi. The Biancocelesti are without a victory in their last seven games in all competitions and haven’t won in Serie A since a 4-1 win at home over SPAL on November 4. That poor run of form has seen them fall off the pace in the race for the Champions League places and a win here will be vital for Simone Inzaghi’s men to remain in the hunt over the Christmas period. The Aquile’s last match was a 1-0 loss away to Atalanta in Bergamo, where Duvan Zapata’s 58-second goal sealed the three points. Inzaghi’s boys huffed and puffed their way through that match and thought they had equalised late on when Francesco Acerbi turned in from close range, but after the celebrations died down the goal was chalked off correctly by VAR for a marginal offside. The Capital outfit have won just four games at home in the league this season, while drawing twice and losing the other two, and they will need to start to pick up home wins soon if they hope to qualify for the Champions League. Inzaghi will have to do without the services of Brazilian midfielder Lucas Leiva, who is a long-term injury absentee, while Valon Berisha has returned to training after his injury problems. The Sardinians meanwhile are on a similar run of poor form, going six Serie A rounds without a win. However, they have only lost twice in their last nine games, while drawing the other five proving that they are a resilient and resolute side under Rolando Maran. Their last outing was a narrow 1-0 loss at home to Napoli in which Arkadiusz Milik’s excellent free kick in injury time gave three points to the Partenopei. Top scorer Leonardo Pavoletti is again missing through injury and he is joined on the side-lines by Greek defender Charalambos Lykogiannis and midfielder Lucas Castro. Meanwhile Luca Ceppitelli and Darijo Srna are still suspended after their red cards in the 2-2 draw with Roma. Cagliari haven’t won against Lazio in Rome since 2009, losing all seven visits on the bounce, conceding 18 goals. Empoli are seeking their fourth consecutive home victory, but host a Sampdoria side rediscovering their form and unbeaten in four. Samp haven’t lost in the league since their 4-1 defeat away to Roma in the middle of November and will be a tough test for 14th-placed Empoli. The home side themselves are in great form coming into Week 17, winning three and drawing one ahead of last weekend’s Tuscan Derby loss to Fiorentina. Empoli won the Serie B title last season and are enjoying their time in the top flight, sitting five points clear of the drop zone. A win for Beppe Iachini’s men would only move them up one place in the table to 13th, but would take the pressure off going into Christmas. As for Sampdoria, they will be hoping to enter the festive period in the European places and victory could lift them as high as fourth. The home side have four players at risk of suspension going into the game, with Domenico Maietta, Leonardo Capezzi, Giovanni Di Lorenzo and Ismaël Bennacer all holding four yellow cards. Rade Krunic does sit out a one-match ban in midfield. Gianluca Caprari scored his third Serie A goal of the season for Sampdoria last time out against Parma and he’ll be looking to continue his form in front of goal. Bartosz Bereszynski is still out of action, so Jacopo Sala again takes on the role of full-back. Marco Giampaolo will be desperate to finish the first half of the season in the top six, and a win against a plucky Empoli side should help him do just that. Sampdoria are unbeaten against Empoli in Serie A since January 2007, emerging with four wins and as many draws. Struggling Genoa will be hoping to pick up their first win under Cesare Prandelli, as the Grifone welcome a high-flying Atlanta side to Marassi on Saturday afternoon. Genoa are now under the tutelage of their third manager, and it is not even the halfway point of the season. Croatian tactician Ivan Juric was again sacked after losing to third-tier Virtus Entella in the Coppa Italia, thus marking the end of his third spell in charge of the club he once featured for as a player. Juric’s hiring did raise some major eyebrows, especially after Davide Ballardini had seemingly done no wrong in leading the team to a strong start. At the time of his abrupt dismissal, the team under Ballardini were sitting in sixth place, and had slipped to 11th following a 3-1 defeat to Parma. By the time Juric left, they had tumbled even further down the table into 14th. Currently now in 16th place – which sees them just four points clear of the drop zone – Prandelli clearly has a lot of work to do. So far, they have picked up one point from their first two games under the ex-Fiorentina and Azzurri manager’s tenure. However, despite losing 3-2 to Roma last round, Genoa put in a good shift and that improvement will give them some hope as they take on an Atalanta side for whom things seem to be finally clicking after a rough start to the season. Domenico Criscito returns to wear the captain’s armband after his suspension, but Luca Mazzitelli is out of action. Genoa have conceded in each of their last 11 Serie A games, so 12 would be their worst clean sheet run since March 2012. La Dea come into this game having beaten Lazio 1-0, and that further solidifies their chances for a push not just for a Europa League spot, but even for the Champions League. With Milan and Lazio both floundering, Atalanta certainly are in a great position to pip both sides in the battle for fourth, and it has been an impressive turnaround for a team that was in freefall after the Europa League preliminary round exit. At one point, Gian Piero Gasperini’s side were in 17th place, with just one win all season. Week 9 arguably was their big turnaround point, as since then, Atalanta have managed to win six of their last eight Serie A fixtures. Notably, during that run they ended Inter’s seven-game winning streak in the league thanks to a stunning 4-1 victory. In addition, La Dea have bounced back well from two defeats to Empoli and Napoli – which ended their four-game winning streak – to pick up back-to-back victories against Udinese, and most recently, Lazio. Atalanta have won their last three away fixtures against Genoa. Should they win again this Saturday, it will mark the first time in their top-flight history that La Dea have beaten the same opponent four times in a row on the road. Just five points separate Champions League-chasing Milan in fourth and Europa League hopefuls Fiorentina, but the Rossoneri are forced to revamp their midfield. It has been a forgettable couple of weeks for Milan and their boss Gennaro Gattuso. A goalless draw against Torino was followed by an embarrassing Europa League exit at the hands of Olympiacos and that was topped off by another 0-0, this time away at lowly Bologna on Tuesday night. However, despite injuries and recent inconsistencies, Milan have maintained that all important fourth spot and sit two points ahead of Lazio. While fans of the Rossoneri were left ruing that midweek draw and the opportunity to create a gap between them and the chasing pack, focus quickly switches to the visit of Fiorentina. Player availability continues to haunt Gattuso. Boosted by the return of captain Alessio Romagnoli against Bologna, ‘Rino’ was dealt a fresh blow elsewhere. Midfield pair Tiemoue Bakayoko and Franck Kessie are missing through suspension for this one, meaning Jose Mauri and former Viola captain Riccardo Montolivo are likely to be the replacements. Il Diavolo are expected to retain their 4-4-2 with Gonzalo Higuain and Patrick Cutrone in attack. Milan will be desperate to get back amongst the goals after consecutive blanks in Serie A and will be facing their favourite victims in the Italian top flight. Milan have scored a total of 245 goals against Fiorentina, more than against any other team. Fiorentina’s 3-1 over Empoli last weekend in the Tuscan derby broke a run of eight games without a win for La Viola and has kept them in touching distance of the European places. It was a welcome win for Stefano Pioli’s side after struggling to a series of draws in recent weeks. Goals had been a problem in that run, but Fiorentina have now bagged six in their last two outings and will be relieved to see striker Giovanni Simone back on the scoresheet. With confidence returning, the visitors will be relishing this chance to cause an upset and decrease the gap to their Milanese counterparts to two-points in the process. Coach Pioli’s switch to 3-5-2 last week proved successful and it would be no surprise to see that kept in place for Saturday. That change of formation was somewhat forced by suspensions to key defender Nikola Milenkovic and midfield regulars Jordan Veretout and Edimilson Fernandes. Milenkovic is likely to return to the starting XI at the expense of Federico Ceccherini, while Veretout is expected to slot back into central midfield in place of Christian Norgaard. Italian midfielder Marco Benassi will play an important role for his team. The 24-year old is Fiorentina’s top scorer with six and excluding two own goals, he is responsible for three of the six goals La Viola have notched away from Florence. Milan have won three of their last five Serie A games against Fiorentina after having previously only one once in the nine meetings before. The Rossoneri have the chance to make it four consecutive wins over La Viola at San Siro on Saturday, a feat they last achieved back in 1997. Napoli will host SPAL this Saturday as they continue to find their footing following their Champions League exit. For much of their 1-0 win over Cagliari, the Partenopei seemed like a shell of their former self. They lacked their usual attacking prowess, and as a unit, Carlo Ancelotti’s side lacked any type of cohesion. They entered half-time visibly frustrated, but after the break there was a massive switch in mentality for Ancelotti’s side. The Partenopei began putting together fluid attacking movement, but the breakthrough was yet to come. Toward the end of the match, it seemed as if Napoli’s season was about to start flying off the rails, and with a 10-point deficit waiting for them come the final whistle, something had to give for the Partenopei. Arkadiusz Milik came to the rescue for his side, giving them all three points with a beautiful free kick in stoppage time. Milik has been on a hot streak as of late, and he’ll look to continue that streak against a weak SPAL side. The Spallini currently sit in 15th place in Serie A and it’s likely they’ll fall further down the table by the end of matchweek 17. Leonardo Semplici’s side hasn’t won a game since October 20, when they upset Roma at the Stadio Olimpico. Their two-month long winless run looks set to continue this Saturday unless they can come up with the same magic that saw them defeat Roma. In SPAL’s last Serie A run out, they drew 0-0 with Chievo Verona at the Stadio Paolo Mazza. Veteran striker Sergio Floccari almost won it at the death for his side, but his shot cannoned off the crossbar to deny the Italian his winner. Napoli hasn’t lost at home since March of this year, so the likelihood of them losing at the Stadio San Paolo to a relegation side such as SPAL is unlikely. SPAL have lost each of their last nine Serie A meetings with Napoli, home and away. Only two points separate Sassuolo and Torino going into this head-to-head for Europa League ambitions. The intense festive schedule forms a good barometer to see how they will fair for the rest of the season in 2019. 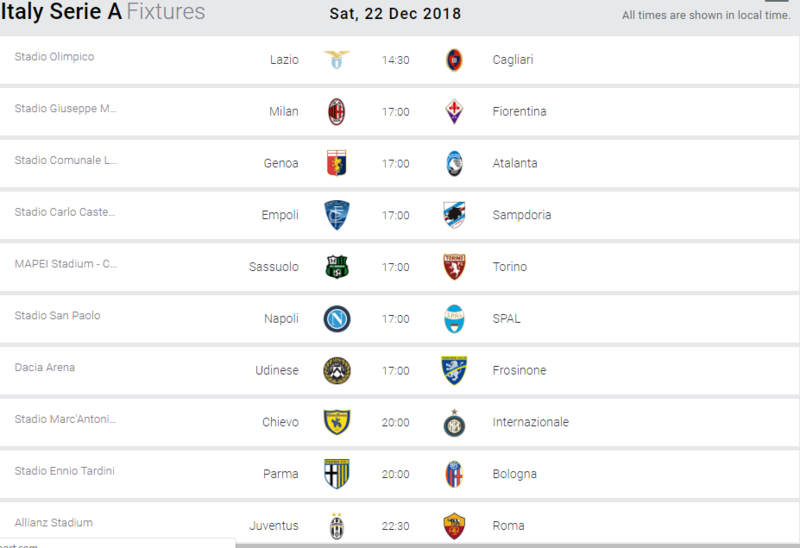 For Sassuolo, who currently occupy eighth spot in the Serie A table and are just a point off the Europa League places, this will be a good opportunity to get an important result under their belt before going up against both Roma and Atalanta in the next seven days, two direct rivals for the fifth and sixth spots. Their 2-0 away win against Frosinone ended a run of four games without a win and put them back within touching distance of their target, but the victory is desperately needed against Torino to keep the team on their toes and with some breathing room ahead of their huge clashes coming up. However, despite their recent win, the form sheet and history at home against Torino may throw up a different story, as their last three wins in the league have all come away from home (Frosinone, Chievo and SPAL), they’ve never beaten Torino in front of their own fans. Torino need the three points just as much, because while they sit in mid-table and are coming into this game off the back of a defeat and a draw, some context is needed to fully see why this game is rather important to Walter Mazzarri’s side. Their last results came at San Siro, where the tried and trusted Mazzarri 3-5-2 kept Milan at bay and got Torino a 0-0 draw for their troubles. The loss came last weekend in a narrow 1-0 defeat to Turin rivals Juventus, courtesy of a Cristiano Ronaldo penalty with just 20 minutes left on the clock. By no means were these results terrible and if they were being 100% honest, Torino probably prepared themselves for this kind of situation. The Granata remain just two points behind Sassuolo and the Europa League places going into the Mapei Stadium. With Empoli at home and a trip to Lazio to round off 2019, Toro will see this as the perfect opportunity to set themselves up for a push for European football. Salvatore Sirigu is increasingly unlikely to recover in time after a knock to his back forced him off during the Turin Derby, while Iago Falque missed that game entirely, but should be available again as partner to Andrea Belotti. Filip Djuricic continues his suspension, with Kevin-Prince Boateng, Claud Adjapong and Jeremie Boga still injured. Torino are unbeaten at the Mapei Stadium in Serie A, emerging with a 2-0 win in 1994 and four draws. Frosinone make their debut under new Coach Marco Baroni in this relegation six-pointer with stuttering Udinese. The home side have the advantage in the table as of now, in 17th place with 13 points from 16 games. Their opponents are currently languishing with the bottom two with a mere eight points. Udinese are a difficult team to figure out. Whilst season-to-season they struggle with the amount of personnel changes, there’s also no doubt this team should be a lot higher than 17th. There have been improvements since Davide Nicola replaced Julio Velazquez, beating Roma and drawing with Sassuolo, while performances in defeats to Atalanta and Inter were at least plucky. Considering their budget, Serie A is always about survival for Frosinone. Moreno Longo took them to promotion via the Serie B play-offs, but the 2-0 home defeat to Sassuolo proved the final straw. He was fired this week and replaced by ex-Benevento boss Baroni, whose Serie A career tally is one point from 12 games. For the Friuliani, the source of their troubles this season is having the ball. With just 13 goals scored, and almost half of those coming from Rodrigo de Paul, they are the third least prolific side in the division. On the defensive side of the ball, they rank a more respectable eighth worst, a lot higher than the other relegation candidates. However, Frosinone boast both the worst attack and defence in Serie A, managing only one win all season. Neither of these sides will gain a predicted advantage from playing home or away. Udinese have seven points from eight home games, whilst Frosinone have four points from eight away games. In terms of team news, Ignacio Pussetto and Valon Behrami were both doubts, but should make the Udinese starting XI. However, Brazilian defender Samir is out for around three months. Lukasz Teodorczyk, Emmanuel Badu and Svante Ingelsson remain long-term absentees. For Frosinone, Joel Campbell and Daniel Ciofani were doubts, but will reportedly recover in time to feature. Luca Paganini, Emil Hallfredsson and Federico Dionisi won’t be seen again in 2018. Frosinone have fired blanks in 10 out of 16 games this season, more than any other Serie A side. Inter aim to get their festive celebrations going 72 hours early as they travel to relegation candidates Chievo Verona on Saturday. Chievo were undoubtedly the basket case of calcio for the better part of this season so far. They began the season with a three-point handicap after being found guilty of false accounting. They are yet to register a single win this campaign, and have drawn seven times with nine losses. The Flying Donkeys have scored just 12 goals so far this year – only Frosinone have scored fewer – while conceding a whopping 32 times thus far – again, only the Canarini have conceded more. However, new Coach Domenico Di Carlo was encouraged by last week’s 0-0 with SPAL and finds his team interestingly on an unbeaten run of five matches in Serie A. During that stretch, they have also snatched points off the likes of Scudetto hopefuls Napoli and top-four contenders Lazio, with the side seemingly brimming with confidence leading into Saturday’s encounter at the Bentegodi. Another positive result against a strong opponent could very well be what Di Carlo’s side need if they are to spark a push for Serie A survival. However, should they do that on Saturday, they will need to do so without Nenad Tomovic, Fabrizio Cacciatore and Joel Obi, who all miss out through injury, and also Ivan Radovanovic after the Serbian midfielder picked up his fifth yellow card of the season in last week’s draw. Meanwhile, Luciano Spalletti’s Inter are aiming for consecutive wins after a 76th-minute Mauro Icardi penalty was enough to see off a resilient Udinese outfit at San Siro last weekend. Spalletti will be hoping to see his side rediscover their early form from earlier in the season after they were bundled out of the Champions League following their disappointing 1-1 draw with PSV. This is a vital game for the Nerazzurri, as they are currently six points behind second-placed Napoli. They face the Partenopei next Wednesday in a massive Boxing Day clash, so this week could be used to gain some ground on Carlo Ancelotti’s boys. Dalbert and Matias Vecino are still injured, plus Kwadwo Asamoah sitting out a one-match ban. Even Radja Nainggolan could be back in the starting XI. Four out of five of Chievo’s wins in Serie A against Inter have been at the Bentegodi, but the most recent was in August 2016. Pippo Inzaghi just about kept his Bologna job with a draw against Milan, but visits a Parma side with surprising European ambitions in the Emilia-Romagna Derby. Bologna managed to get a point from their last game against an improved Milan side on Tuesday. The Rossoblu will be looking to build on that performance this Saturday against their revitalised local rivals. Parma suffered a defeat on the road to Sampdoria and will fancy their chances against a fragile Bologna side who are currently in the drop zone. Surprisingly, the Ducali have struggled to beat two of the bottom clubs in the League, Chievo Verona and Frosinone. This bodes well for Inzaghi’s team, who are 18th in the league with just 12 points. A win for Parma will push them into the top half of the table, but they are only three points off sixth place Atalanta. The good news for Parma is that Gervinho is back in training and should be on the bench, but Roberto Inglese will lead the way with support most likely from Jonathan Biabiany and Luca Siligardi, although Antonio Di Gaudio is pushing for a spot. Francisco Sierralta and Alberto Grassi are all long-term absentees. Bologna are still without injured Erick Pulgar, but there are big choices to be made on the wings of Inzaghi’s 3-5-2 formation. Riccardo Orsolini, Blerim Dzemaili and Mattias Svanberg are all challenging for the role on the right, while Ibrahima Mbaye, Ladislav Krejci and Mitchell Dijks (who has now recovered from a bout of flu) are options on the left. Bologna have not won a Serie A away fixture in 2018, managing five draws and 13 defeats. They conceded at least two goals in each of the last six. Eusebio Di Francesco only earned a Roma reprieve, but has the toughest fixture of all against runaway leaders Juventus. After earning a narrow 1-0 victory against Torino last week, the Bianconeri have now won seven consecutive Serie A games, since drawing 1-1 against Genoa at home in October. Juve’s clean sheet in the Derby della Mole means the Old Lady has now kept opponents at bay in five consecutive rounds. However, Massimiliano Allegri’s men were far from perfect against Toro, as the Granata’s physicality and aggression caused them major problems and prevented Juventus from controlling the game the way they are used to. Luckily for the Bianconeri, Simone Zaza’s error resulted in the penalty that Cristiano Ronaldo converted, winning a game they hardly deserved to. The win against the Granata means that Juventus managed to keep their healthy eight-point advantage over Napoli, before the toughest part of the season. The clashes against Atletico Madrid in the Champions League will require the Bianconeri’s full attention in February, as the Spanish club was arguably the worst possible draw for Juventus, alongside Liverpool. On the other hand, Di Francesco went through the nine circles of hell, after seeing Roma trailing twice before eventually beating Genoa 3-2 at the Stadio Olimpico last week. Goalkeeper Robin Olsen made two terrible howlers, but luckily for Roma just one of them was punished, as VAR disallowed a goal after his second one. The victory means Di Francesco will live to fight another day, but the ex-Sassuolo Coach knows well that a heavy loss against Juventus on Saturday might still result in his sacking. Roma currently occupy seventh place, sitting just three points behind Milan in fourth. However, prior to their win against Genoa, La Magica had failed to win each of their last five games in all competitions. What is even more disturbing than Roma’s results, is their performance, as the Giallorossi looked lost and shapeless for long periods. Roma’s chances on Saturday will be boosted by the return of Edin Dzeko, who is expected to start against the Bianconeri. The Giallorossi have sorely lacked leadership in the absence of both Dzeko and Daniele De Rossi, as the younger players have shown that they are still not ready to step into the veteran pair’s boots. Cengiz Under, Nicolò Zaniolo and Justin Kluivert, who scored his first Serie A goal against Genoa, are expected to start alongside Dzeko and it will be interesting to see if the combination between experience and youth will manage to trouble Juve’s backline. The game promises to be a fascinating one and with Roma finally getting closer to fourth place, the visitors will be extremely motivated to come home with a result. However, despite some lapses in concentration lately, Juventus is still a much more solid side at the moment and have both more quality and more experience in their ranks. The Bianconeri will try to pin Roma back from the start and if that happens, the visitors’ chances would be very slim, as the Giallorossi have the joint-worst defence in the top half of the table with 22 goals conceded. Sami Khedira, Emre Can and Leonardo Spinazzola have all recovered from their injuries and are once again at Allegri’s disposal. However, Juve will still have to do without Juan Cuadrado, Andrea Barzagli and Joao Cancelo, who is recovering from a knee surgery. De Rossi is slowly recovering from his own fitness issues, but still probably not in any condition to play, with Stephan El Shaarawy and Lorenzo Pellegrini in the stands. Roma have lost all eight gamesthey have played at the Juventus Allianz Stadium in Turin since the venue was opened in 2011. Juve have scored 20 and conceded just three goals during that stretch.